It includes two amp simulations channels (with pre and post effects) that can be mixed together or used alternatively like a real amp. You can choose your amp models from hundreds of presets or launch the amp editor to build your own, with complete control over the tone. Additional input and master sections let you adjust the tone at the input and the output of Axiom, with 4 additional effect slots each and an integrated high precision tuner. A brickwall limiter also protects the output from overshoot. And, because playing alone is not so much fun, Blue Cat have added a tools section with 3 additional slots to load virtual instruments: add a metronome, a drum machine, sequencer or your keyboardist's favorite synthesizer there to get it mixed with your guitar. Credits: This plug-in includes several factory presets created by Hans Van Even. Powerful and unlimited multi-effects processor and amp modeling software for guitar and bass. Realistic and fully customizable amp simulation based on Blue Cat's Destructor. Flexible routing: 2 parallel amp simulation channels with effects + input and master sections. Includes Blue Cat's Destructor and Late Replies as built-in effects. Open and extensible: load any third party VST, VST3 or Audio Unit (AU) plug-in. Delivered with thousands of presets for all sections and built-in effects. Load third party virtual instruments to play along. Lock sections to prevent changes when loading presets. For the plug-in, any DirectX / VST / AAX compatible host software (32 or 64 bit). For the standalone application, an ASIO, MME or WASAPI compatible audio interface (ASIO recommended). Mac OS Sierra (10.12), Mac OS X El Capitan (10.11), Mac OS X Yosemite (10.10), Mavericks (10.9), Mountain Lion (10.8), Lion (10.7). For the plug-in, any VST / Audio Unit (32/64-bit) / AAX compatible application. For the standalone application, a Core Audio compatible audio interface. 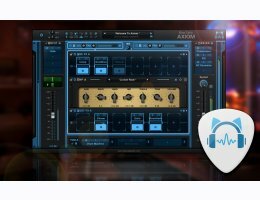 Download a demo version of Blue Cat Audio's Axiom here. 5 instances of the plug-in allowed per session. The effect is bypassed for half a second every minute.